Amish made desks are like no other. They are well-crafted, durable, works of art. Each desk is made by a Northeastern Ohio Amish craftsman in his woodworking shop. Sometimes three generations will work together to make the desks, passing on Old World skills that have been shared for centuries. Once the desk is finished, it is wrapped in blankets and brought to our store, Amish Originals, in a horse-drawn wagon. We have a vast collection of Amish made desks for you in our store. Each piece of the desk is carefully cut and fitted together with precision. The drawers are dove-tailed for durability. The wood is smoothed and finished with expertise. The desk maker takes pride in his work and only sells the desks that meet his own high standards. 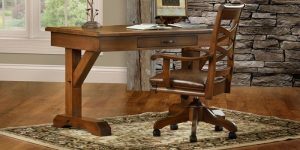 Whatever your desk need is, you’ll find a lovely, well-built, durable product at Amish Originals. Each one is built individually—no assembly line desks here! You can even custom order the exact product you want. Contact us for more information on getting the desk of your dreams. Get directions to our store and view the desks for yourself. Enjoy the beauty as you run your fingers over the smooth wood. Sit behind one, and imagine it in your home or office. Tell us how we can help you.